Mayon Volcano, located in the province of Albay on the island of Luzon in the Bicol Region, is a near perfectly shaped cone resting some 15 kilometres northwest of Legazpi City. It is an active stratovolcano, and the last recorded eruption was in 2006, the 2,462 meter high volcano spewed some 17 million metric tons of molten rocks which flowed surpassing the 7km PDZ at the southeast portion of the volcano. Mt. 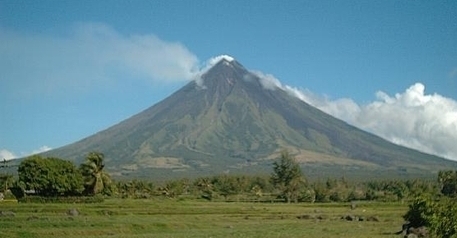 Mayon is the center of Mayon Volcano National Park (21 square miles - 55 square km). It is extremely well-liked by climbers, hikers, and campers. The lower slopes contain abaca plantations, some of which are quite large. Since the beginning of the 1600's more than 30 eruptions have been recorded. Mayon Volcano can be destructive and in 1814 it erupted and buried the town of Cagsawa. The area within the park is rich in philippine plants and native animals. Among the vegetation found is narra, dapdap, anonang, anabiong, agoho, balagubang, langaton, tree ferns, tagunguirit, pitcher plants, orchids, abaca, rattan, and lakad-bulan. The native animals which can be seen are wild pig, civet cat, singalong, Philippine monkey, wild chicken, Philippine deer, orioles, wild doves, tariktik, kuro-kuro, crow, monitor lizard, owl and tagbaya. Legazpi City is a mere 15 kilometers away from the volcano and a good base with which to explore the area. Legazpi City is considered the business center and is the capital of Albay Province, Philippines. Mayon Volcano is vying to be included among the New 7 Wonders of Nature and is in the ninth spot together with other Philippine natural wonders the Tubataha reef (2nd place), Chocolate Hills, in Bohol, and the underground river in Palawan.